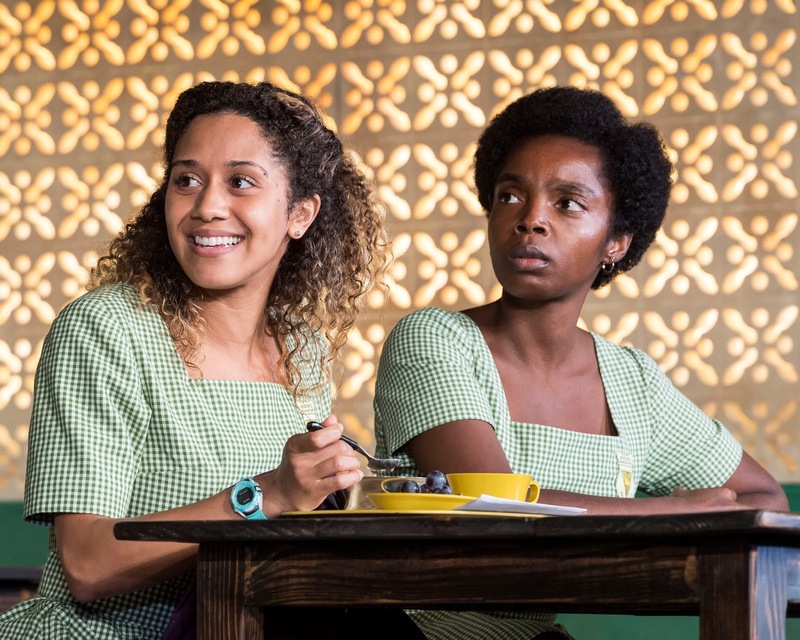 Jocelyn Bioh’s "School Girls (Or, the African Mean Girls Play)" has taken over the Kirk Douglas Theatre in Culver City until the end of September 2018. 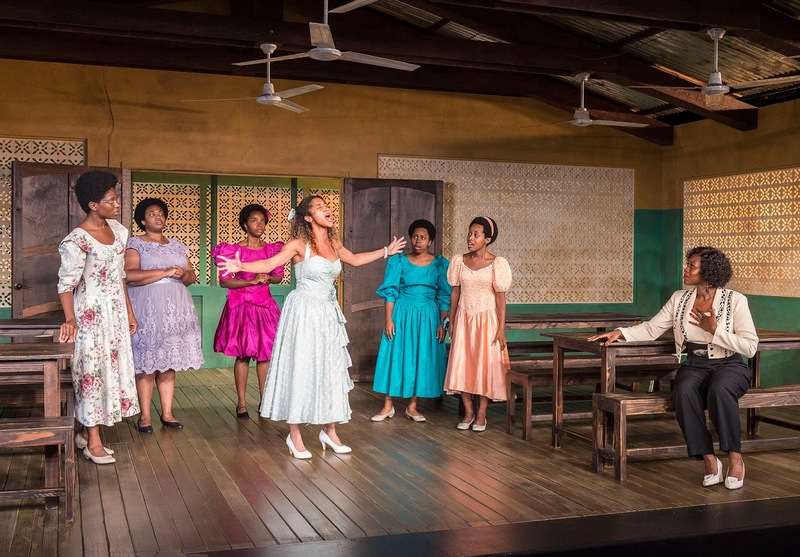 Much like the name suggests, it's a comedic-drama that brings to life the tale of six young ladies as they tackle typical teen ordeals and other tough issues, set in 1986 in the midst of the upcoming Miss Universe pageant. 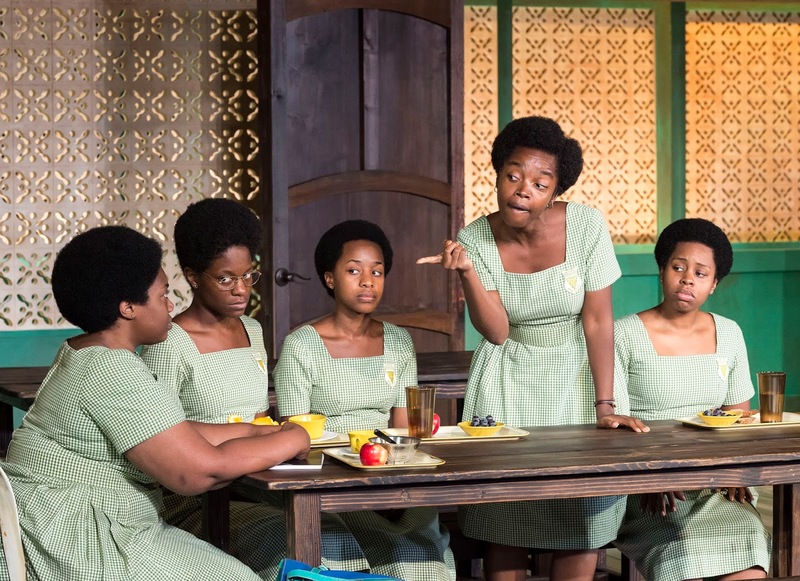 We’re immediately introduced to the core group of friends, all pictured below — the pensive Nana (Abena Mensah-Bonsu), cousins Mercy (Mirirai Sithole) and Ama (Latoya Edwards), and the quieter but very bright Gifty (Paige Gilbert), all led by their fierce and fearless leader Paulina Sarpong (MaameYaa Boafo, who's standing in the photo below). 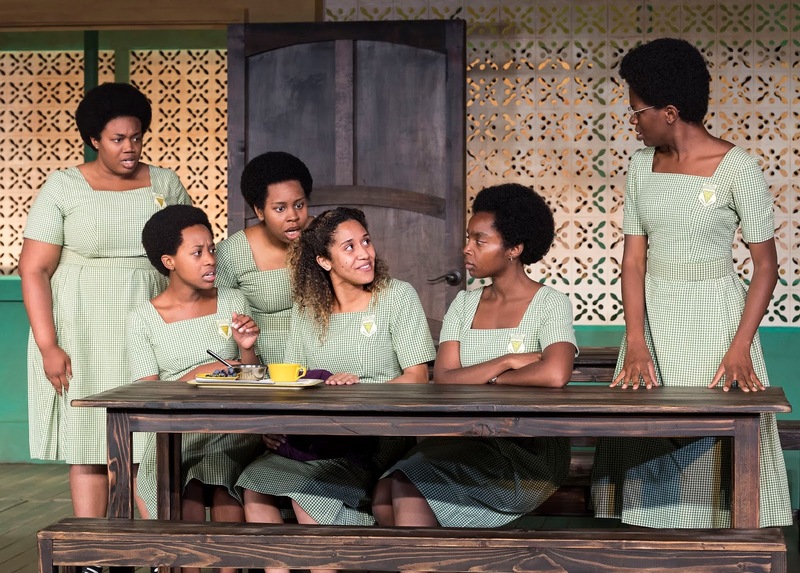 When newcomer Ericka Boafo (Joanna A. Jones, sitting down in the photo below) relocates to the school from the States, she unintentionally shakes the fragile hierarchy of the girls’ friendships. Tensions increase even more when Ericka decides to participate in the race to find Miss Ghana, who would eventually compete in the Miss Universe pageant. While the entire group of friends had planned to enter, everyone had assumed Paulina would win. 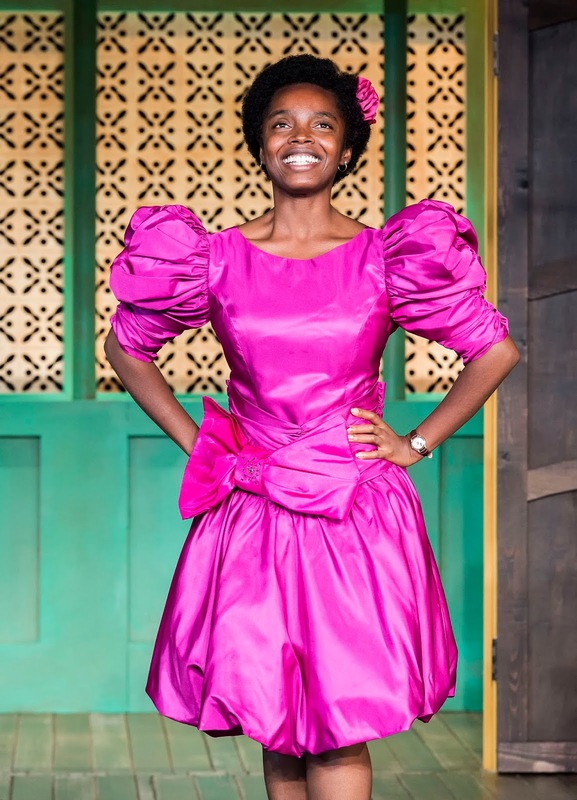 But Ericka’s kind and generous disposition, fascinating dresses, secret talents — and fairer complexion and longer hair — gravely threaten Paulina’s assumed reign. 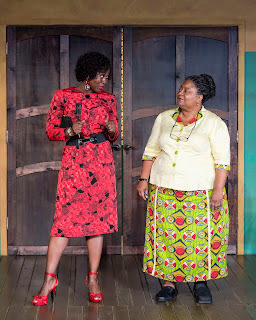 Under the watchful eye of Headmistress Francis (Myra Lucretia Taylor, below in the green skirt) and a highly anticipated visit from Miss Ghana 1966 Eloise Amponsah (Zenzi Williams, below in the red dress), the girls find themselves learning more about themselves and one another than they ever could have imagined. Quick-witted dialogue and tongue-and-cheek banter make the show incredibly entertaining. The girls' lively excitement and innocent naïveté transport the audience back to those good ole high school days — that awkward era when being accepted meant so much, and cattiness and shifting loyalties were the norm. We see Paulina struggle to defend her sovereignty as group leader from Ericka, and Nana proves just how far she’s willing to go to be accepted. Plus, a good juicy high school drama wouldn’t be complete without betrayals, puppy love and figuring out how to mold to — or break — societal beauty standards. And since it’s ’86, there’s nothing like a dose of Bobby Brown and his energetic hits to round out the story, too. In some sense, it’s comical to see how much Western culture dazzles and fascinates the girls. Aside from swooning over Bobby Brown, all of them want to wear dresses shipped from the States and Paulina proudly claims knows someone who works at White Castle and who can get her Calvin Kleen dresses from NYC’s Chinatown. Plus, their riveting performance of Whitney Houston’s Greatest Love of All during the Miss Ghana pageant tryouts is another testament to their love for the music, too. It’s interesting to see how our U.S. culture can be revered and even sometimes misconstrued when we see it through the lens of a completely different perspective. Yet even with its lighthearted sentiment throughout, the production still broaches some serious, deeply rooted topics. It explores colorism, or the system where fairer skin is more valued than darker skin. We feel the tension initially emerge when Ericka, who is a caramel tone (she’s half-white and half-Ghanaian) first enters the boarding school, with the chocolate-hued girls curiously asking about her lighter skin. Colorism rears its ugly head again in the form of lightening cream and the controversial debate on what the next Miss Ghana’s skin color should be. Their tender age and the bonds of sisterhood unfortunately don’t shield them from having to deal with how beauty is unfairly represented, both on local and global scales. Diving even a bit deeper, I’d say "School Girls" even tackles the concept of power, both perceived and real. Not only do we see the power struggle between Paulina and Ericka (both pictured below) for the coveted title of group leader, but we watch them confess to each other how much more of an advantage they think the other has. Plus, we watch as both Headmistress Francis and Eloise reveal through their actions just how much power they have — or don’t have. I found myself deeply disappointed in how the only two adults in the entire story failed to use their influence to create positive change. 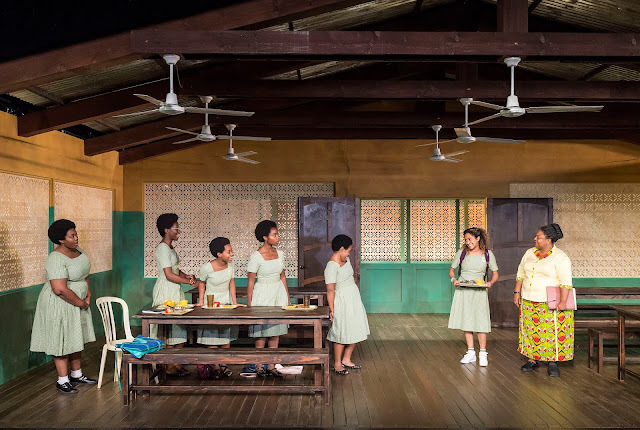 At times "School Girls" tinges on the melodramatic side, but all in all, it’s a highly energetic, fast-paced production that truly feels like it passes way too quickly. If you’re anything like me, you’ll find yourself laughing so hard that tears stream down your face, getting super upset at the unjust situations the girls have to face, and at other moments, anxiously twitching as you’re transported back to those trying teen years. Should you decide to see "School Girls," I recommend staying for the post-show audience talks. 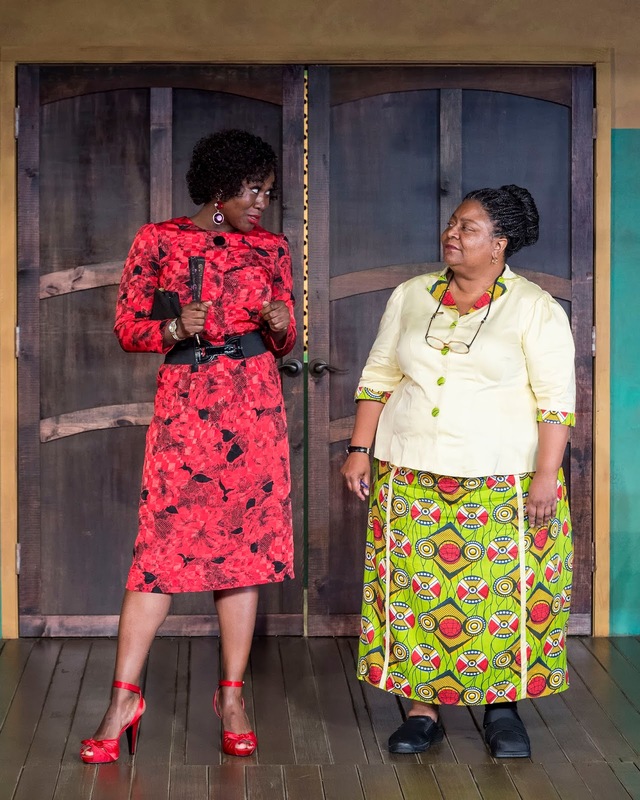 Curated by Kirk Douglas Theatre team members, guests are prompted to share their thoughts about the show and it’s interesting to hear everyone’s different takeaways. This production featuring an all-female cast is only going on for a few short weeks more, so don’t wait long to check it out.